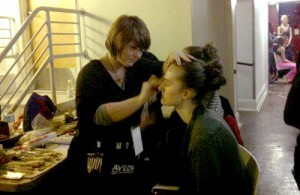 Ginger Pendley working on a model backstage at New York Fashion Week 2013. Spending 5 days in NYC for Mercedes-Benz Fashion Week is always such a blast for us! We jet off to New York filled with butterflies, enthusiasm and excitement and return with new-found passion for our craft, albeit totally worn out. 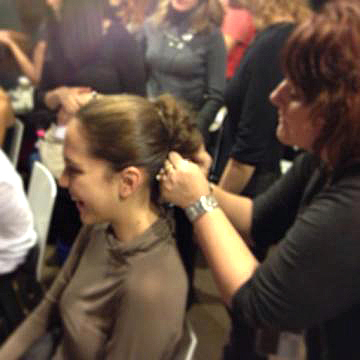 Amanda, Jessica and I had the great pleasure again this season to be hands-on backstage for the 2013 fall fashion showing. Covering hair and make up we were privileged to work with top designers including Ann Yee, Marlon Gobel, Titania Inglis, Designer’s Review, Assembly New York, Designer’s Premiere, We Rep Premiere and Porsche Design. It only took a moment for me to answer myself — at the end of the day it’s because of the deep passion I have for this industry. Fashion Week is just an extension of that. Being able to see designers at their best, giving 100% of their selves as we do on a daily basis to our guests is awe-inspiring. Even though the glitz & glam of New York Fashion Week seems to be at a very different level than a soccer mom’s best hair day, the truth is, fashion is all intertwined. Amanda working on a fresh face at New York Fashion Week 2013. Each of us have our own unique brand. We wear it everyday, from the clothes we put on to the hairstyle we walk out the door with each morning. Our brand, our fashion is part of who we are. The new styles at fashion week and out on the red carpet, the great hair, makeup and clothing are all one package, they each wouldn’t be the same without the other. 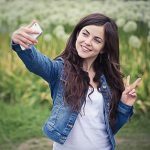 While it makes little sense to be vain about your appearance, it makes perfect sense to be true to your own personal brand. 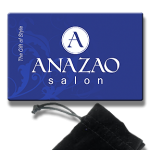 Fashion & style is our brand at Anazao and it will be so long as fashion is in style! Thanks for reading. Now go take on the world!